One thing is for sure in South Texas, you are guaranteed to go from winter straight into summer weather. Spring in Texas means we see 90 degree weather almost daily. Seriously if you blink you might miss the cool spring breeze. Today for instance is we are in the high 80’s and hotter temperatures are on their way. I am not complaining by any means, I love spring and summer. Being outdoors for long periods of time during peak hours is tricky and calls for ways to keep cool. Being a mom of three boys guarantees me countless hours outdoors. 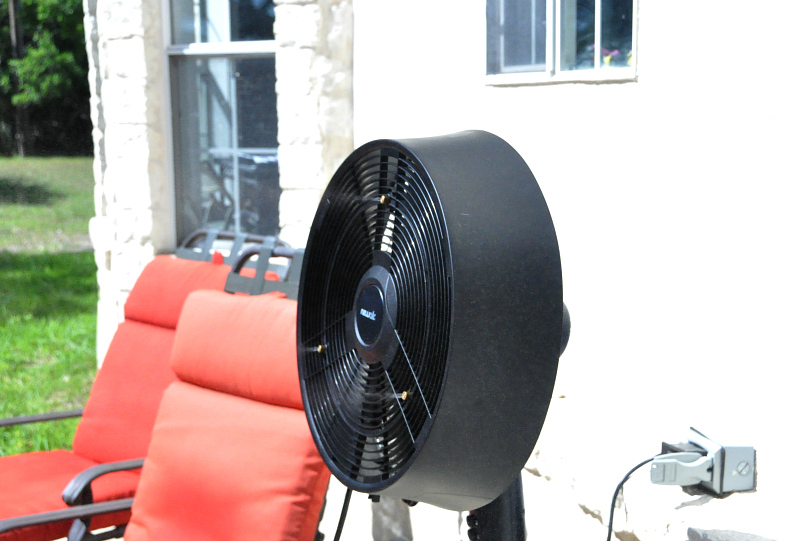 My cool off fix usually consists of ample shade, a cold drink in hand and now the NewAir AF-520B Outdoor Misting Fan. Sing the praises of a misting fan keeping the temperature down with me guys. I really can’t imagine I have ever survived my backyard before this addition. 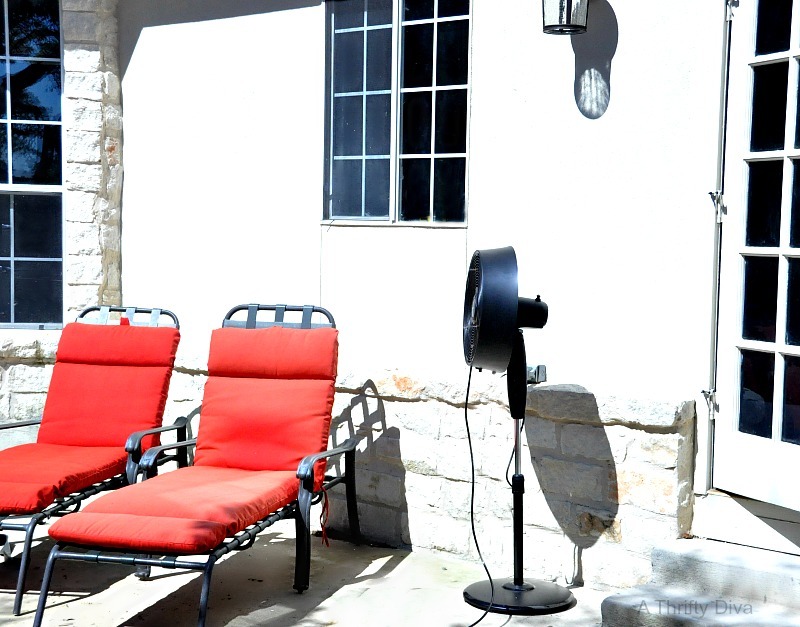 Lounge chair, book, iced tea and the NewAir AF-520B Outdoor Misting Fan. NewAir AF-520B Outdoor Misting Fan does come conveniently boxed up so you don’t have to drag this huge fan out of the store or figure out how to fit it in your car. That was a bonus for me. It does take some assembly, but really simple. So simple I did it in about 15 minutes. I suggest taking all the pieces out of the box, lying them out and reading the instructions once before assembly. Once assembled take your NewAir AF-520B Outdoor Misting Fan to a spot where you can conveniently plug it in and where it will reach a water hose. I hadn’t thought about this prior so I did have my hose across my patio until I could get a smaller garden hose that wraps around my patio rather than over it. The three settings and oscillating feature are great. I am able to cool off our patio effortlessly and move around while still feeling the air. The fan drops the temperature of our open patio from five to ten degrees. The fan is sturdy and doesn’t give even on a windy day. If you are too close to the fan misting feature you will get “wet”. Even with the water pressure on very low, if we go up to the fan to turn it off or change settings you will get wet. I also am not a fan of the huge plug. It is not ideal to plug into an outlet as it takes up most of the space for anything else to get plugged in. Connect with NewAir on their website www.newair.com and on the NewAir facebook page.